Most animals are made up of millions of cells, yet all animals evolved from ancestors that spent their whole lives as single cells. Today the closest single-celled relatives of animals are a group of aquatic organisms called choanoflagellates. Certain species of choanoflagellates can also form swimming colonies. This kind of multicellularity might resemble that seen in the earliest of animals. As such, studies into modern-day choanoflagellates can give insights into how the first animals to evolve might have behaved. Many organisms can find their way towards favorable areas using different strategies. For instance, bacteria can bias their tumbling to gradually swim towards food, and algae can turn and move directly towards light. While choanoflagellates require oxygen, it was not known if they could also actively navigate towards it, or any other resource. Now, Kirkegaard et al. find that the choanoflagellate Salpingoeca rosetta can indeed navigate towards oxygen – an ability called aerotaxis. This was true for both individual cells and for colonies made up of many cells. This discovery suggests that the transition from living as a single cell to living as a simple multicellular organism could still have allowed the earliest animals to seek out and move towards resource-rich areas. Aerotaxis requires cells to both sense oxygen and react appropriately to changes in its concentration. Kirkegaard et al. watched choanoflagellate colonies swimming under controlled conditions and varied the oxygen concentration in the water over time. These experiments revealed that the colonies navigate based on the logarithm of the oxygen concentration, so that at low oxygen levels the cells were even more sensitive to small changes in oxygen concentration. This type of ‘logarithmic sensing’ is similar to how our ears sense sounds and our eyes sense light. Kirkegaard et al. went on to conclude that the colonies were not actively steering in the correct direction directly. Instead, the colonies appeared to choose directions at random and later decide whether such a turn was correct. It remains unclear whether the common ancestor of animals and choanoflagellates could also perform aerotaxis, and if so what mechanisms this involved. Further studies to compare aerotaxis and aerotaxis-related genes in simple animals and other single-celled relatives of animals would be needed to illuminate this. Future studies could also explore the maximum and minimum oxygen concentrations that choanoflagellates can detect, and how well they navigate at these upper and lower limits. Taxis, the physical migration towards preferred or away from undesired conditions, is a feature shared by virtually all motile organisms. Taxis comes in many forms, and in common is an underlying field of attractant (or repellent) and an ability to react and navigate along gradients of this field. Bacteria do chemotaxis towards nutrients (Adler, 1969; Berg, 1993) and away from toxins (Tso and Adler, 1974). Algae do phototaxis towards light (Yoshimura and Kamiya, 2001; Drescher et al., 2010) and gyrotaxis along gravitational potentials (Kessler, 1985). Chemotaxis provides a mechanism for the recognition and attraction of gametes (Vogel et al., 1982) and for complex behavioural patterns such as in the slime mould Dictyostelium discoideum, where cAMP-driven chemotaxis is a critical part of the formation of the multicellular stage of the life cycle (Bonner, 1947). Aerotaxis, defined as oxygen-dependent migration, is well-characterized in bacteria (Taylor et al., 1999), but is poorly studied in more complex organisms. This is despite the essentiality of oxygen for all aerobic life, and the important role that Precambrian oxygen levels played in the emergence and evolution of multicellular animal life (Nursall, 1959). One group of aquatic heterotrophic protists, the choanoflagellates, are of particular interest for the study of how multicellularity evolved. Choanoflagellates are a class of unicellular microorganisms that are the closest relatives of the animals (Lang et al., 2002). This relationship was first proposed by James-Clark in 1866 (James-Clark, 1866), on the basis of the resemblance between choanoflagellates and the choanocytes of sponges. The sister relationship between choanoflagellates and animals was further confirmed in the genomic era by molecular evidence (King et al., 2008). All choanoflagellates share the same basic unicell structure: a prolate cell body with a single beating flagellum that is surrounded by a collar of microvilli. The beating of the flagellum creates a current in the surrounding fluid that guides suspended prey such as bacteria through the collar (Pettitt and Orme, 2002) where they can be caught and ultimately phagocytosed. The flagellar current also has the effect of causing the choanoflagellate cell to swim. The choanoflagellate Salpingoeca rosetta can form colonies through incomplete cytokinesis (Fairclough et al., 2010). In the presence of certain bacteria (Dayel et al., 2011; Levin et al., 2014), these colonies have an eponymous rosette-like shape as shown in Figure 1. The colony morphology is variable, and the constituent flagella beat independently of one another (Kirkegaard et al., 2016). 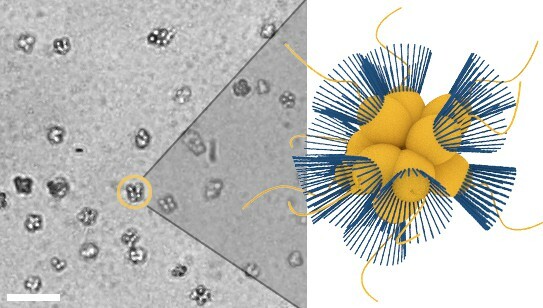 The random and independent flagellar motion argues against there being any coordination between cells in a colony, and as yet no evidence of any form of taxis for choanoflagellate colonies has been reported. Micrograph of S. rosetta colonies (left) with schematic illustration (right, collars in blue). Scale bar: 50 µm. Cell body diameters are ~5 µm. The geometry, flagella independence and lack of taxis observed in S. rosetta colonies contrast with other lineages, such as the Volvocales, a group of green algae (Goldstein, 2015). Phototaxis is clearly observable in both unicellular (Chlamydomonas) (Yoshimura and Kamiya, 2001) and colonial (Volvox) (Drescher et al., 2010) species, in order to maintain optimum light levels for photosynthesis. Volvocalean phototaxis is deterministic, requiring precise tuning between the internal biochemical timescales and the rotation period of the organism as a whole. Although S. rosetta colonies also rotate around an internal axis, due to the variable colony morphology and the independent beating of the individual flagella, this rotation rate will itself be random (Kirkegaard et al., 2016), rendering a strategy similar to that of the Volvocales unlikely in S. rosetta. An alternative strategy is stochastic taxis, sometimes referred to as kinesis. The classic example of stochastic taxis is the run-and-tumble chemotaxis of certain peritrichous bacteria (Berg, 1993). By spinning their left-handed helical flagella in different directions, such bacteria can alternate between swimming in straight lines (running) and randomly reorienting themselves (tumbling). Through biasing tumbles to be less frequent when going up the gradient, the bacteria exhibit biased motion towards a chemoattractant without directly steering towards it (Berg, 1993). Here, we study S. rosetta and show that it exhibits aerotaxis, i.e. navigation along gradients of oxygen. We further examine and statistically analyse aerotaxis of S. rosetta colonies under spatio-temporal variations of oxygen at the level of total colony populations and at the level of the trajectories of individual colonies. From these experiments we establish two key features of the aerotactic response of choanoflagellates: they employ a stochastic reorientation search strategy and the sensing of oxygen concentration gradients is logarithmic. Finally, we render these results quantitative through the use of mathematical analysis of a modified Keller-Segel model (Keller and Segel, 1971). The study of aerotaxis in bacteria has led to numerous methods for creating spatial oxygen gradients (Shioi et al., 1987; Wong et al., 1995; Zhulin et al., 1996; Taylor et al., 1999), one of which is the exploitation of soft lithography techniques (Adler et al., 2012; Rusconi et al., 2014). Since PDMS, the most commonly used material for microfluidic chambers, is permeable to gases, gas channels can be introduced in the devices to allow gaseous species to diffuse into the fluid. For example, an oxygen gradient can be created using a source channel flowing with normal air and a sink channel flowing with pure nitrogen. Our device, shown schematically in Figure 2, is a modified version of that used by Adler, et al. (Adler et al., 2012). Viewed from above, the sample channel (yellow) consists of a wide observation chamber with thin inlet and outlet channels. The outlet leads to a serpentine channel that hinders bulk fluid flows. On each side of the sample channel are gas channels, the inlets of which are connected to a valve system allowing for the flow of air (20% oxygen) and nitrogen. The flow of air and nitrogen can be conducted in any combination and configuration, e.g. oxygen in one channel and nitrogen in the other, and can be easily swapped over. 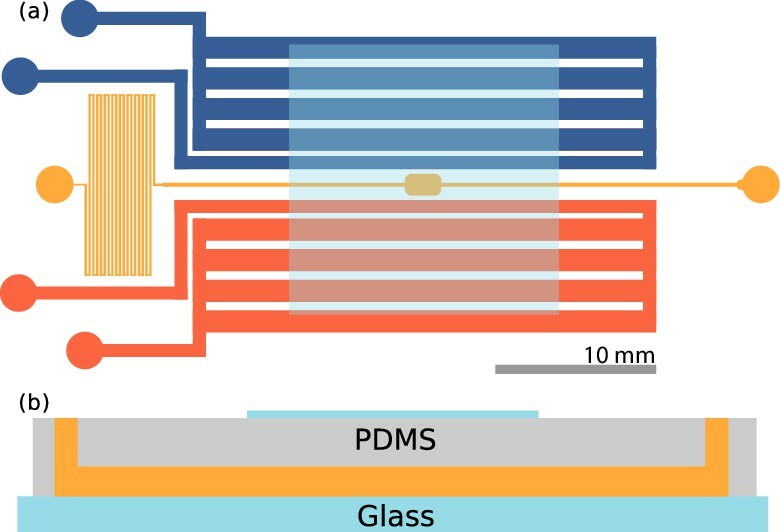 The PDMS chamber is plasma etched to a glass slide, and an extra glass slide is etched on top of the device, preventing air from diffusing in from the surrounding environment. (a) Top view of the device. The sample channel (yellow) is loaded with culture and observed in the middle chamber. The side channels (red, blue) are gas channels in which oxygen and nitrogen may be flown. Scale bar: 10 mm. (b) Side view of the device. PDMS is plasma etched to a glass slide, and a cover slip is plasma etched on top, centered on the imaging chamber, also shown in (a). Thickness of the channels are ≈115 µm. Experiments were carried out immediately after plasma etching as the permeability of gases slowly decreases thereafter. Cultures of S. rosetta were introduced at the inlet of the device, and both the inlet and outlet were then closed to prevent evaporative flows. A gradient of oxygen was set up by having air flowing in one of the side channels and nitrogen in the other. Our main experimental result, shown in Figure 3a,b, is the observation that S. rosetta colonies accumulate at the oxygen-rich side and away from the oxygen-poor side, i.e. that they are aerotactic. We also found aerotaxis in the unicellular fast swimmer form (Dayel et al., 2011) of S. rosetta, showing that this is not an exclusive phenomenon to colonies. Aerotaxis of S. rosetta colonies. (a–b) Micrographs near an oxygen-rich wall at twice the resolution of that used in the density experiments. Scale bar: 50 μµm (a) Colonies approach a wall where the oxygen-concentration is high. (b) Colonies staying near this wall. (c) Density evolution of S. rosetta during experiment. At each time step the distribution is normalized to a probability distribution [colorbar units in µm−1]. Colors on the side indicate what gas is flowing in that side channel, red for oxygen and blue for nitrogen. Ncolonies~150, concentration ~5 · 106 mL−1. (d) Keller-Segel model with log-concentration input given by Equation 4, D = 865 µm2/s, α = 1850 µm, vdrift = 5.2 µm/s. With the present microfluidic device we can explore more details of choanoflagellate aerotaxis by dynamically changing the oxygen boundary conditions, for instance by flipping the gradient direction or by removing all oxygen influx after a uniform distribution has been reached. Figure 3c shows the result of such a dynamic experiment over the course of ∼3.5 hr. The density is normalized for each frame and the noise present is partly due to colonies missing in the tracking in some frames. Many repetitions of the experiment show that the behaviour in Figure 3c is highly repeatable and robust to changes in the details of the cycling protocol (See Figure 3—figure supplement 1). For consistency the figures in the main text are based on this specific protocol. Whenever one gas channel contains oxygen and the other nitrogen, the colonies swim towards the oxygen-rich side as further shown in Video 1 . In the time after a gas channel swap, the slope of the maximum density reveals the ensemble drift velocity vdrift. When there is oxygen in both gas channels, we observe that the density reaches an approximately uniform distribution within the time frame of the experiment. For periods in which nitrogen flows in both channels, this is not the case. Under these experimental conditions, the colonies accumulate in the middle of the chamber, where there is still some residual oxygen, as further shown in Video 2. The fact that in this nitrogen-only configuration the colonies accumulate mid-chamber shows that accumulation does not depend on the presence of a nearby surface. With only nitrogen flowing, eventually there will be no oxygen gradient. Nonetheless, we observed the colonies to stay in the middle of chamber even after 90 min (see Figure 3—figure supplement 1). At that time, the highest oxygen levels are estimated by the diffusion equation to be less than ~0.2%. Experimental videos of aerotaxis (top) and oxygen gas simulation (bottom) (as in Figure 6). Experimental videos are colored by the output of the gas simulation. Colonies migrating from one side to other after a swap of nitrogen and air (138–148 min. in experiment of Figure 3). 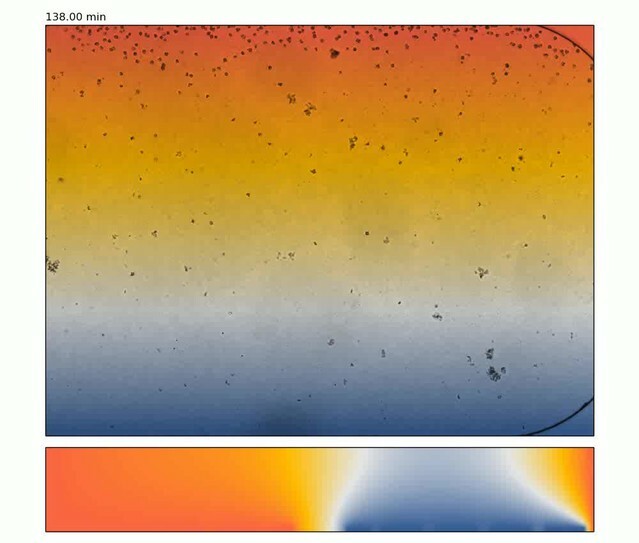 Colonies migrating from the middle to the sides after a change from nitrogen only in the two gas channels to air only (45–55 min in experiment of Figure 3. This contrasting behaviour between the oxygen-only and nitrogen-only configurations suggests an asymmetry or non-linearity in the aerotactic response. If the response to oxygen concentration had been linear, the observation of the density band in the nitrogen-only section would imply similar density bands at the chamber edges in the oxygen-only section, which is not observed. Instead one might hypthesize that the colonies navigate along relative (∇c/c) instead of absolute (∇c) gradients, i.e. reacting to gradients that are comparable in magnitude to the background concentration. This is also known as logarithmic sensing, and we will confirm in the modelling section that this hypothesis can quantitatively explain the experiments. Strategies of taxis can be categorized into two main classes: deterministic and stochastic. In both strategies the swimming organism measures the attractant gradient (for small organisms by some temporal filter [Block et al., 1982; Celani and Vergassola, 2010]). A deterministic strategy, then, is one in which the organism directly steers towards the attractant, such as seen in sperm cells that modulate their flagellar beat to adjust directly the curvature and torsion of its swimming path in the gradient direction (Friedrich and Jülicher, 2007; Jikeli et al., 2015). Contrasting is a stochastic strategy such as bacterial run-and-tumble locomotion (Berg, 1993), where modulation of the frequency of random reorientations biases the motion in the gradient direction without directly steering towards it. One simple method of taxis results from an organism swimming faster when it is moving up the gradient, creating an overall bias towards the attractant. With the detailed colony-tracking in the present study it is possible to test whether this mechanism is in operation with S. rosetta. Figure 4—figure supplement 1 shows examples of tracks during periods of uniform swimming (t = 70 min) and after a gas channel swap (t = 142 min). Figure 4 shows the evolution of the mean colony swimming speed v (green) as well as the component velocities vx (yellow) and vy (purple), averaged over ~150 colonies in each frame. For most times, the component velocities average to zero, but after a gas channel swap the y-component peaks. The ensemble average swimming speed in these sections, however, does not show an increase, suggesting that a velocity modulation is not the method of taxis. To quantify this further, the inset of Figure 4 shows the swimming speed in these sections plotted against the alignment to the gradient c^vy/v where c^=±1 signifies the direction of the gradient. The plot shows a very small (~3%) change in swimming speed going up the gradient. Velocity-biased taxis can be described by v(t)=v(p^)p^, where e.g. v(p^)=v(1+γp^⋅∇c/|∇c|), γ being the velocity-modulation taxis parameter. p^, the direction of swimming, is unbiased by the attractant field c and evolves by rotational diffusion. To obtain a drift velocity ~1/3 of the swimming velocity, as we find for S. rosetta in the following section, the velocity modulation would have to be γ= 2/3 for a two-dimensional swimmer and γ = 1 in three dimensions, much larger than the ~3% observed. We conclude that the primary mechanism of aerotaxis in S. rosetta is therefore not a modulation of swimming speed. Running mean velocity statistics, showing that the primary mechanism of aerotaxis is not by modulation of swimming speed. Evolution of mean speed (green, right axis) and velocity in the x-direction (yellow, left axis) and y-direction (purple, left axis), y being along the gradient of oxygen. Left and right axes have equal ranges. Side bars indicate gas flowing, oxygen (red) or nitrogen (blue). The peaks of vy do not quite reach the true drift velocity due to smoothing of the curves. Inset shows the speed as function of alignment with the gas gradient c^⁢vy/v at times after a swap. c^=1 if the gradient is up and = −1 if down. S. rosetta colonies swim along noisy helical paths, and each colony displays distinct helix parameters (Kirkegaard et al., 2016). To perform any kind of statistical angle analysis, we consider ensemble average quantities: the speed v and rotational diffusion dr, and average helix rotations out. Figure 5a shows the angular distribution data during the swaps, where, for the purposes of displaying all the data in a single graph, we have let θ→−θ for times when the oxygen gradient were pointing down. This distribution favors the up-direction θ=π/2. More interesting is the distribution of reorientations. For this we define the angle turned by a colony in a time Δt as Δ⁢ϕ=|θ⁢(t+Δ⁢t)-π/2|-|θ⁢(t)-π/2| such that it is positive if the turn is in the direction of the gradient and negative otherwise, and choose Δt low enough that −π<Δϕ<π. Figure 5b shows this distribution. The distribution is centred on zero, revealing that the colonies do as many turns in the wrong direction as in the correct direction. This indicates that the colonies navigate by a stochastic strategy. Experimental data in grey bars. Deterministic model in purple and stochastic in green. (a) Distribution of θ. θ=π/2 is along the gradient. (b) Change in angle Δ⁢ϕ for Δt = 0.65 s. Positive change corresponds to a turn towards the gradient. Deterministic parameters: ϵd=0.28⁢s-1,dr=0.52⁢s-1. Stochastic parameters: ϵs=0.55,dr=0.33⁢s-1. The functional 𝒱 specifies the population drift velocity’s dependency on the local oxygen concentration, i.e. the drift of cells due to taxis. For a fixed response, the functional would equal a constant 𝒱=vdrift. 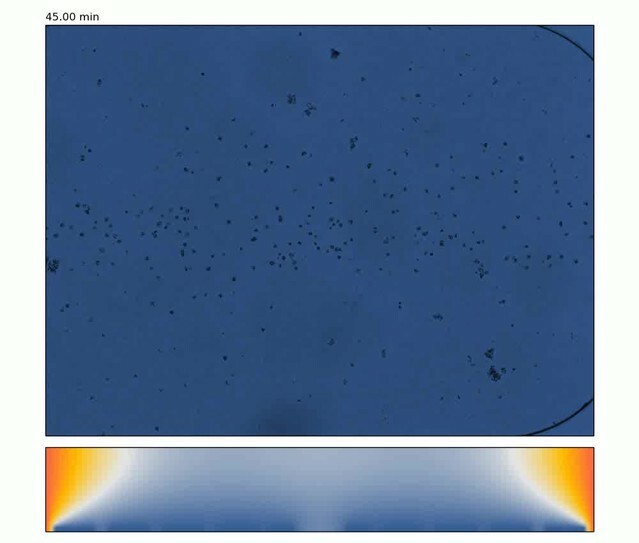 D and Dc(x) are the colony and oxygen diffusion constants, the latter of which varies with position inside the microfluidic device, with values Dc,PDMS=3.55×10−3mm2/s in PDMS (Cox and Dunn, 1986) and Dc,water=2.10×10−3mm2/s in water (Cussler, 1997). Using in-house software, we solve Equation 2 on a cross-section of the microfluidic device with time-dependent boundary conditions corresponding to the experimental protocols. Gas channels with oxygen flowing have the condition c=20% (for theory the unit of oxygen is not important and we find percentage to be the most intuitive measure). For channels with nitrogen flowing c=0. Glass interfaces have no-flux conditions n^⋅∇c=0, where n^ is the surface normal. A snapshot from the numerical studies is shown in Figure 6a at a time following a swap of nitrogen and oxygen channels, thus showing residual oxygen above the channels now filled with nitrogen and vice versa. The simulation can now be evaluated at the position of the observation chamber. Note that the no-flux conditions at the glass interface render the concentration gradients in the z-direction very small, so the precise height of evaluation is not significant. The simulation with boundary conditions corresponding to those in the experiment of Figure 3c is shown in Figure 6b. To a very good approximation the concentration field is constant along the x-direction. Figure 6c shows the oxygen field evaluated at y = −250 µm (red curve). Neglecting the consumption of oxygen by the colonies, these results provide the input concentration field c for the Keller-Segel model. Simulation of oxygen concentration in microfluidic device. (a) Simulation of 2D cross-section of the device. Oxygen concentration boundary conditions are imposed at the gas channel positions. Snapshot shows t = 110 min, ~1.5 min after the swap. White line indicates evaluation location at the observation chamber. (b) Evolution of oxygen concentration at z = 100 µm. (c) Simulation at y = −250 µm. Oxygen percentage in red (left axis), and spatial gradient in purple normalized to fit in [−1, 1] (right axis), response function tanh⁡(α∇c(x,t)/c(x,t)) in green (right axis). where vdrift must be smaller than the swimming velocity. This choice behaves linearly for small gradients, but tends asymptotically to a maximum value for large gradients. Most of the behaviour of Figure 3c can be explained by this model (See Figure 3—figure supplement 1), but not the section where nitrogen is flowing in both side channels. The reason is the aforementioned asymmetry between the sensing-signalling in low versus high oxygen concentrations, which we argued may be explained by relative gradient sensing, also known as logarithmic sensing since ∇log⁡c=∇c/c. For unidirectional gradients (say, in the y-direction) this expression reduces to 𝒱[c]=vdrifttanh⁡(αcy/c)y^, where cy=∂c/∂y. Since the logarithmic sensing cannot be maintained at infinitely small concentrations, there must naturally be some lower cutoff to this expression in absolute concentration levels. Nonetheless, from a modelling perspective we can ignore this for the present experiments with nitrogen-only sections lasting less than 1.5 hr as discussed. Figure 6c shows that the spatial oxygen gradient cy (purple curve) compares to y^⋅𝒱[c] of Equation 4 (green curve) at all times except in the nitrogen-only section, where the log-response function does not decay towards zero. A positive value of the response function means a positive (y) drift velocity. The Keller-Segel equation with log-sensing is able to explain all sections of the experiment, as demonstrated in Figure 3d. The parameters obtained from a numerical fit include the drift velocity vdrift = 5.2 µm/s (which should be compared to the ensemble average swimming speed v = 16.5 µm/s, the speed averaged over all colonies) and the diffusion constant D = 865 µm2/s. Using the ensemble-averaged speed, the diffusion constant can be related to an effective rotational diffusion constant Dr=v2/2D=0.16s−1. The parameter vdrift represents the coupling between the oxygen-gradient response and the resulting population drift, but it is a purely phenomenological quantity in which the underlying microscopic mechanism of aerotaxis is hidden. To explain the origin of vdrift we must consider the navigation strategy. where θ is the instantaneous swimming direction, and we choose motion along the positive y-axis (θ=π/2) to be toward the attractant. Illustration of deterministic and stochastic strategies based on discretised simulations with exaggerated steps. Time evolves from left to right. Orientations, shown by green arrows, are trying to align to up-motion, θ=π/2, indicated by red (oxygen) at the top and blue (nitrogen) at the bottom. (a): Deterministic strategy, described by Equation 6. Deterministic part in yellow and stochastic part in purple. The deterministic part is always in the correct direction. (b): Stochastic strategies, described by Equation 7. All steps are stochastic, but largest when furthest away from θ=π/2. where −1≤ϵs≤1 and the multiplicative noise is interpreted in the Itō sense. This process is illustrated in Figure 7b. In both models, ϵ is an effective ensemble average response. To compare to the experiments, ϵ should be replaced by a function coupled to the gas concentration field through 𝒱[c], thus coupling to Equation 5. The steady state gradient in the experiment is approximately linear, and thus as a first approximation Equations 6, 7 should describe the angle statistics in the time between the swap of gas channels and reaching the opposite side. In our experiments, after a flip in the oxygen gradient direction, the colonies reach the opposite wall in a time comparable to that for oxygen to diffuse across the chamber. Thus, a true steady state is not reached, but during the intermediate times a steady state approximation is accurate. Solving the Fokker-Planck equations corresponding to the systems Equations 6 and 7 in steady-state, we obtain theoretical angle distributions (see Materials and methods). Both models are able to describe the data in Figure 5a well, with the deterministic model (purple) fitting the down-gradient swimming best, and the stochastic model (green) fitting the up-gradient swimming best. Both fits involve a single parameter, kd=ϵd/2dr in the deterministic model and ϵs in the stochastic one. We now move beyond steady-state distributions to examine the detailed statistics of the trajectories themselves. We recall our definition of the angle turned by a colony in a time Δt as Δϕ=|θ(t+Δt)−π/2|−|θ(t)−π/2| such that it is positive if the turn is in the direction of the gradient and negative otherwise. The Equations (6) and (7) imply distributions of Δϕ (see Materials and methods). Figure 5b shows the best fit of both models to the data. For the stochastic model (green) ϵs is known and the fit is in dr and matches well. The deterministic (purple) is constrained by kd=ϵd/2dr, and the fit can be done in dr as well. We see clearly that the deterministic model does not provide a satisfactory fit to the data. In detail, the value of ϵd needed to fit the data in Figure 5a shifts the mean of pd(Δϕ) in the positive direction. This result persists with any amount of smoothing applied to the data, averaging out active rotations. We thus conclude that the colonies navigate by a stochastic strategy, and that the ensemble angle statistics can be captured by this simple model. In other words ϵs=(2vvdrift)/(v2+vdrift2) is the ratio of the squared geometric mean to the quadratic mean of the average and drift velocities. For the fitted ϵs=0.55, vdrift≈0.3v≈5 µm/s, consistent with the fitted value in the Keller-Segel model. We have shown that colonies of S. rosetta can navigate along gradients of oxygen, thus exhibiting positive aerotaxis. The cells navigate along relative oxygen gradients and the navigation strategy is stochastic in nature, achieved by modulating not speed but direction of swimming. The experimental observation that choanoflagellates are aerotactic raises a number of questions. One concerns the actual sensing mechanism, and how this compares to those of animals, given the close evolutionary relationship between choanoflagellates and metazoans. In animals, oxygen concentrations can be sensed by the highly-conserved hypoxia-inducible factor (HIF) transcription factor pathway (Loenarz et al., 2011; Kaelin and Ratcliffe, 2008; Rytkönen et al., 2011). At normal oxygen levels, the activity of specific prolyl-hydroxylase (PHD) enzymes labels the HIF protein complexes for degradation. At low oxygen levels, however, PHD activity is inhibited, leading to elevated HIF levels. The transcription factor activity of HIF up-regulates expression of genes involved in hypoxia response (e.g. glycolysis enzymes) for survival in low-oxygen conditions (Greer et al., 2012). The genes involved in HIF signalling are widespread in metazoans, with evidence suggesting that some components of this pathway are descended from prokaryotic ancestors (Scotti et al., 2014). Preliminary experiments involving exposing S. rosetta cultures to DMOG (an inhibitor of the prolyl-hydroxylase step in the HIF pathway [Fong and Takeda, 2008]) had no observable effect on aerotaxis within our experimental system (data not shown). This is perhaps unsurprising, given that choanoflagellates lack some important components of the HIF pathway (Rytkönen et al., 2011). Additionally, the aerotactic response observed here is acute, within a timeframe on the order of seconds to minutes, rather than the being a longer-term response to lowered oxygen levels by modulation of gene expression. In certain aerotactic bacteria, it is known that oxygen concentrations are measured indirectly via energy-sensing, which can then influence the rotation of the bacterial flagella between running and tumbling (Taylor et al., 1999). An analogous mechanism may be at play in choanoflagellates, possibly via reactive oxygen species (Cash et al., 2007) and oxygen-sensitive ion channels (Lahiri et al., 2006; Ward, 2008) modulating the beating rate of the flagella of each S. rosetta cell. Thus the question of the molecular and cellular mechanisms underpinning aerotaxis in choanoflagellates is a promising avenue for further research. Oxygen is implicated as having an important influence on animal evolution (Nursall, 1959; Lenton et al., 2014), with some hypotheses that the emergence of complex animal ecosystems (Sperling et al., 2013) were only triggered when oxygen levels rose above certain thresholds. Sponges, believed to be the most basal animal group, were recently shown to have very low oxygen requirements, disputing the importance of oxygen in early animal evolution (Mills et al., 2014). Our results raise the possibility that the common ancestor from which choanoflagellates and animals evolved was aerotactic, and that oxygen sensing and responding have thus been under strong selection throughout the holozoans. If the ancestors of animals and choanoflagellates were strongly aerotactic, this would be indicative of the importance of oxygen as a resource during the Precambrian (Lyons et al., 2014). Equally, it could be the case that choanoflagellates themselves have evolved aerotaxis after the split from the animal stem lineage. To answer this question, the oxygen requirements and aerotactic capabilities of other opisthokont groups, e.g. ichthyosporeans, filasterians (Ruiz-Trillo et al., 2008; Sebé-Pedrós et al., 2013), as well as basal animals such as sponges, ctenophores and placozoans (Dunn et al., 2008; Ryan et al., 2013; Pisani et al., 2015; Whelan et al., 2015), requires investigation. Such an analysis can be further complimented by determining the oxygen sensing and signalling mechanisms across the opisthokont phylogeny. If aerotaxis was key to the ancestral unicellular holozoan, it is crucial that the evolution to multicellularity did not hinder this ability. Our experimental results show that both the unicellular and colonial morphotypes of S. rosetta can perform efficient aerotaxis and navigation in general, despite lacking coordination between the constituent cells of the colony (Kirkegaard et al., 2016). Therefore, an evolutionary transition to a multicellularity resembling the unicellular-to-colonial transition in S. rosetta (Dayel et al., 2011) would not require additional cell-cell communication mechanisms to coordinate navigation. Not only would this allow aerotaxis towards oxygen, but also taxis in response to other stimulants, such as bacterial signals (Woznica et al., 2016). This is a particular feature of the stochastic navigation strategy, which works equally well for both single cells and colonies formed from multiple units of the same cells. We have described the stochastic strategy of S. rosetta in terms of an effective model. The effective bias parameter ϵs is the result of flagella modulation. Flagella can be imaged on colonies stuck to the microscope slide (Kirkegaard et al., 2016), but measuring directly the flagella modulation is challenging, since the oxygen changes that can be induced in a microfluidic device are on a time scale of minutes, whereas the flagella beating is on a time scale of tens of milliseconds (Kirkegaard et al., 2016). The swimming trajectories suggest that this modulation is a mixture of many types, ranging from slow to vigorous, as also seen in other organisms (Jikeli et al., 2015), but direct imaging is needed to make more quantitative statements. We have shown that in spatio-temporal varying environments, considerations of population dynamics can distinguish between linear- and logarithmic-sensing mechanisms, and concluded that choanoflagellates do logarithmic sensing. The fact that conclusions of logarithmic sensing can be made from analysis of the population dynamics alone shows that individual tracks are not needed and thus allows for such analysis in dense experiments. Logarithmic sensing is a key attribute for survival: it allows sensing of and reacting to gradients in very low concentration environments, while still being able to effectively navigate along large gradients. Logarithmic sensing has also been experimentally observed for other species, e.g. bacteria (Mesibov et al., 1973; Kalinin et al., 2009). With logarithmic sensing, cells only navigate along oxygen gradients that are significant compared to the absolute concentration. This is a well-known phenomenon also from human behaviour, where, for instance, dim lights are seen only when it is dark and weak sounds heard only when it is quiet. It is known as Weber’s law (Ross, 1996), which states that the magnitude of just-noticeable differences of a stimuli is proportional to the stimuli magnitude itself. This is closely related to the Weber-Fechner law, stating that stimuli magnitude grows logarithmically with the actual signal, which we have found to be in agreement with the experimental observation of S. rosetta aerotaxis. For microorganisms, a Weber lower limit can be understood, at least partly, as a physical limitation. Because of thermal fluctuations, the error on any concentration gradient measurement increases with the local absolute concentration (Berg and Purcell, 1977; Endres and Wingreen, 2008), and thus it immediately follows that the limit of just-noticeable gradients must decrease with absolute concentration. Quantitatively, the noise scales as ∼c1/2 in the absolute concentration (Endres and Wingreen, 2008). Such a scaling is not observed for bacteria’s just-noticeable limits, where instead Weber’s law hold (Mesibov et al., 1973). Sensor adaptation enables the bacteria to have the linear scaling ∼c (Sourjik and Wingreen, 2012) leading to logarithmic sensing and high dynamic range, but it is nonetheless the case that for purely physical reasons a lower limit scaling with concentration must be present. The fitting of the Keller-Segel model to the population data were optimal precisely for relative gradient sensing. Sensing functionals such as ∇c/c or ∇c/c2 only decreased the fit quality. This implies that Weber’s law and logarithmic sensing, at least to a good approximation, is occurring in chaonoflagellates. This scaling could be further studied by measuring the aerotactic response to an order-of-magnitude range of concentration gradients under a range of absolute concentrations. Precision control of gas mixtures would allow the extraction of any biological deviations from Weber’s law and potentially reveal a transition to the physical limit of c scaling for very low concentrations, i.e. at the limit of sensing. S. rosetta were cultured polyxenicly in artificial seawater (36.5 g/L Marin Salts [Tropic Marin, Germany]) with organic enrichment (4 g/L Proteose Peptone [Sigma-Aldrich, USA], 0.8 g/L Yeast Extract [Fluka Biochemika]) at 15 µl/mLμ, and grown at 23°C, split weekly. Cultures were centrifuged to reach the high concentrations, ∼5×106ml−1, used in experiments. Microfluidic devices were manufactured using standard soft-lithography techniques. The master was produced by spinning SU8-2075 (MicroChem, USA) at 1200 rpm to a thickness of ~115 µm. Chambers were cast in PDMS, Sylgard 184 (Dow Corning, USA), and plasma etched to the glass slides. Cultures were concentrated by centrifugation before loaded into the device. Gas cylinders containing pure nitrogen and air (20% oxygen) were connected via a system of valves to the gas channels of the device. Experiments were filmed (Imaging Source, Germany) in bright field at 10 fps on an inverted Zeiss LSM 700 Microscope. To track colonies, we first generated a running-median video, where each pixel in each frame of the experimental video is the median of that pixel taken over the neighbouring ~2.5 s of video. This method extracts an estimated background, i.e. a video without the colonies present. Subtracting this from the original video, the resulting video contains only the colonies and noise. Band-pass filters were used to remove the noise, and finally the colony positions were found by locating local maxima in the Gaussian filtered video. where yi are the tracked positions, σ a standard deviation of separation, and the denominator adjusts for boundary effects. Hereafter ρ(y)=η(y)/∫y0y1η(y′)dy′ is the normalized density. For velocity and angle statistics, the tracked positions were linked solely by proximity. If the image analysis algorithm failed to identify a given colony over fewer than three successive frames the integrity of the track was preserved by keeping a running memory. After the trajectories were obtained, spurious trajectories less than three frames in length were removed. Examples of trajectories are shown in Figure 4—figure supplement 1. The final tracks contain ~150 trajectories in each frame, varying slightly over the course of the experiment due to loss of colonies in the tracking and swimming in and out of observation chamber. Oxygen diffusion and Keller-Segel equations were numerically solved using in-house software with finite difference spatial discretisation and implicit time-stepping. Lab on a Chip 12:4835–4847. Journal of Experimental Zoology 106:1–26. Free Radical Biology and Medicine 43:1219–1225. Journal of Polymer Science Part A: Polymer Chemistry 24:621–636. Cell Death and Differentiation 15:635–641. Annual Review of Fluid Mechanics 47:343–375. American Journal of Science 42:320–324. Journal of Theoretical Biology 30:225–234. Progress in Biophysics and Molecular Biology 91:249–286. The Journal of General Physiology 62:203–223. European Journal of Protistology 38:313–332. H. E Ross, D. J Murray, editors. UK: Taylor & Francis. Molecular Biology and Evolution 28:1913–1926. Current Opinion in Cell Biology 24:262–268. Annual Review of Microbiology 53:103–128. Bulletin of Mathematical Biology 70:1570–1607. Biochimica Et Biophysica Acta (BBA) - Bioenergetics 1777:1–14. Plant and Cell Physiology 42:665–672. Thank you for submitting your article "Aerotaxis in the Closest Relatives of Animals" for consideration by eLife. Your article has been favorably evaluated by Naama Barkai as the Senior Editor and three reviewers, one of whom, Richard M Berry (Reviewer #1), is a member of our Board of Reviewing Editors. 1) Choanoflagellates, small colonial eukaryotes, show taxis towards oxygen. 2) Oxygen responses are proportional to relative rather than absolute oxygen gradients (logarithmic). 3) Taxis is achieved by modulation of swimming direction, not swimming speed. 4) Modulation of direction is stochastic, not deterministic. The data are convincing, the modelling thorough and appropriate, and the conclusions sound. 1) The paper reads as written from a theoretical perspective, with the experimental data as an accessory. This needs to be reversed, the significance of the paper is in the experimental data. Results 1, 3 and 4 above are directly demonstrated by the data of Figures 3, 6 and 8B respectively, and this should not be hidden behind the modelling as it currently is. The asymmetry between all-air and all-nitrogen flows is also evident in Figure 3, and the inference of logarithmic sensing from this is simple to make without quantitative modelling. The data should be described and the inferences drawn, and the modelling relegated to its proper place as quantitative verification of the inferences that can be made directly from the data. Correspondingly, the data and their analysis need to be described much more thoroughly. The algorithms for obtaining tracks need to be better described than the present "Colonies were tracked using custom in-house software". Also, show some examples of tracks, and give statistics i.e. numbers of tracks used for each result presented, and any selection or other processing of tracks that was done. For example the Discussion states, "The fact that such conclusions can be made from population dynamics alone allows similar analysis to be done in dense populations, where long individual tracking is not possible." – but nowhere in the manuscript is it possible to know whether current experiments were done under this condition or not! 2) The statement and discussion of the significance of the results needs to be altered and expanded. At present, the entire paper is based on the premise that choanoflagellates are important to study, because, as the closest living unicellular relative of animals, they can provide unique insight into the origin of animal multicellularity. While this might be true, it is a tricky argument to make correctly, and many authors fall into the trap of assuming that choanoflagellates are representative of the actual ancestor of animals. To be clear, choanoflagellates are not representative of the actual ancestor of animals – they diverged from the actual ancestor of animals ~800 million years ago and have been changing (evolving!) all that time. Indeed, these authors make this mistake as well. In last sentence of the Discussion, they say "Our results add to this discussion, in showing that their evolutionary precursors, the choanoflagellates, have evolved to navigate actively towards oxygen." The problem with this logic is that, of course, choanoflagellates are not the evolutionary precursor to animals- those are long extinct. Without looking at aerotaxis in a phylogenetic context, including many unicellular linages of opisthokonts, we don't know if this particular lineage of choanoflagellates evolved aerotaxis prior to the split with animals, when oxygen levels were a fraction of what they are today, or if they evolved it during the intervening ~800 million years. In fact, a trait like oxygen is a particularly poor candidate for the choanoflagellate-as-protoanimal comparison (in contrast to, say, a mechanism of cellular signaling that is highly conserved), since oxygen levels have changed dramatically during the period of time after which choanoflagellates split from the animal stem lineage, and the ability to respond to oxygen is almost certainly a trait that is under strong selection. Thus, while I completely believe the authors that modern-day S. rosetta is positively aerotactic, this work does not tell us anything about whether the ancestor of animals was aerotactic. Instead, the multicellularity argument could be moderated and still be interesting. For example, while making it clear that this work does not tell us whether aerotaxis evolved prior to the origin of animals, it shows that it is a possibility. The authors should suggest how, with further experiments in phylogenetically diverse unicellular lineages diverging from the animal stem group, researchers could test this hypothesis using pretty standard phylogenetic tools. They should also spend some energy in the Discussion explaining why it matters if the unicellular ancestor of animals is aerotactic. We already know that they were capable of aerobic metabolism – how would it change our view of animal multicellularity to know that they swim towards this key resource? Since they lose the intrinsic importance of a discovery (e.g., that the ancestor of animals was aerotactic), it is important to explain why the general idea is important. One possibility might be that the importance lies in showing that a form of apparently disorganized multicellularity, which may or may not model early metazoan life, but models it as well as anything that we are aware of, is capable of any taxis. Although aerotaxis is relatively common, it is still surprising that S. rosetta can do it, because it does not coordinate its flagella (cf. the Volvocales, in which there is a lot of high profile work on e.g. phototaxis). This suggests possibilities for how early multicellularity may have worked. 3) Logarithmic sensing requires some simple explanation for non-mathematical readers. Simply put, response is proportional to relative rather than absolute concentration gradient. This result requires more discussion. Give more examples of logarithmic sensing from literature. Are there any exceptions, where sensing is linear, or is logarithmic sensing universal? 4) The entire evidence for the logarithmic response is the persistence of a band of choanoflagellates in the center of the device as oxygen is slowly depleted. This one observation is interpreted a quite complicated model, which has some parametric freedom (although the model fitting is well justified and reasonable). Can one design a different control experiment in which logarithmically sensing cells are predicted to behave differently than cells that have the flux-response given in Equation (3)? E.g. some kind of pulse chase in which they follow a declining flux gradient. It is difficult to imagine how this experiment can be performed, but the point is that the fact that one observation is hard to predict with an existing model only suggests possibilities for alternate models. Additional experiments allow these possibilities to be explored. Thank you for this comment. We have now reversed the structure of the paper and discussed all experimental results before ending with a single section of modelling. As we wish to reach as broad an audience as possible, this change will prevent readers not familiar with the theory from having to look for the experimental results between the model details. We believe this rearrangement has indeed improved the manuscript's readability. The Methods section has now been expanded to include details of the tracking algorithm and track statistics. We have also added a supplementary figure showing examples of tracks. The sentence quoted above was meant to underlie that our conclusion of logarithmic sensing was not based on individual tracks. We merely wanted to point out that no matter how concentrated our suspensions had been, we could have drawn our conclusion based on the population dynamics alone. We understand, nevertheless, how in its current form the sentence implies that the suspension was not concentrated and we have thus rephrased the sentence. In any case, the tracking details now added to the Methods section should now fully specify our experiments. We thank the reviewers for pointing this out. This is a very welcome comment. Indeed, we had not spent much space in the manuscript discussing the evolutionary context of our results, and undoubtedly our last paragraph in the Discussion was inadequate. We are grateful for having this pointed out. Our Discussion has now been significantly expanded and now includes a section on the relation between animals, choanoflagellates and their common ancestor. We furthermore made it clear, as pointed out in the above comment, that phylogenetic experiments and analysis are needed to make conclusions on the aerotactic capabilities of the common ancestor. In the Introduction we had mentioned this distinction between the Volvocales and S. rosetta. We are grateful to the reviewers for suggesting that we should also include this in discussing why aerotaxis and our results are important. We have now added a section in the Discussion on this. With the reorganisation of the paper we now also explain logarithmic sensing in the Results section, before the modelling. We have furthermore included details on the generality of logarithmic sensing and mentioned the Weber-Fechner law in the Discussion, where we also discuss the necessity of some non- linear scaling on purely physical grounds. While our results definitely exclude Eq. (3) as a possible taxis functional, the parametric fit of the Keller- Segel model does not guarantee that Eq. (4) is precisely the correct form. Nonetheless, we have now mentioned in the Discussion that other slight variations give only worse fits, suggesting that indeed Eq. (4) is the correct one to good approximation. To extract the exact biological functional and observe the differences to Eq. (3), variations on our experiment can be performed with different gas mixtures e.g.by performing an experiment with a gradient built up using 0 and 1% oxygen gas cylinders and comparing to an experiment with 19 and 20% oxygen. Under a linear functional these experiments would give the same results, but not under logarithmic sensing. We have now suggested such future experiments in the Discussion. Work supported by the EPSRC and St John’s College (JBK), ERC Advanced Investigator Grant 247333 and a Wellcome Trust Senior Investigator Award. © 2016, Kirkegaard et al.